I love it. So, as I sit at my desk on this snowy morning (hello, snowstorm that may reach 30 cm!) I started thinking how my songs are my mantras. When I start to feel like I am slowing down or feeling defeated I put on a power song to push me through. 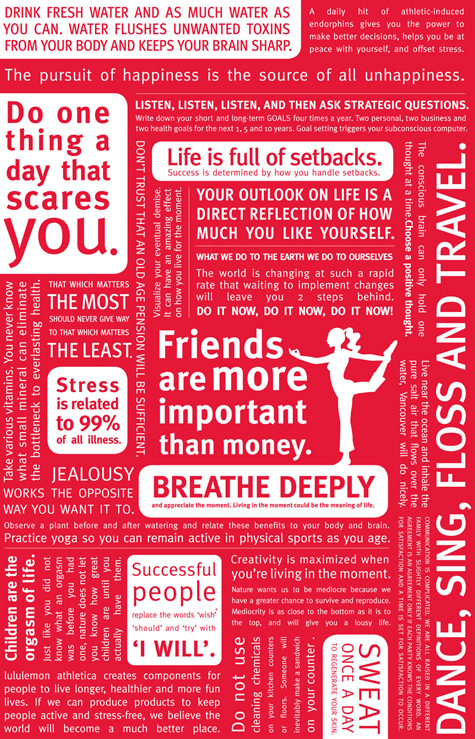 And maybe I will fall in love with a mantra like one of lulu’s on the right. Such as, Breathe Deeply. That is an important one. I do find myself rechecking with my breath during my run and once I exhale, I usually have a huge smile on my face. I think my mantra isn’t something that I should rush to find and it will come naturally one day. I love new song days! If you have any favourites, please send them my way! This entry was posted in http://schemas.google.com/blogger/2008/kind#post, Lululemon, Mantra, Natasha Bedingfield, Runner's World, The Hungry Runner Girl by Siobhan McCarthy. Bookmark the permalink. I think one of my all time feeling great songs would be “Stronger”.. The Britney or Kanye one?! Because I love them both! I feel ya on the mantras thing. I always want one but always feel so cheesy saying them. Instead, music brings a renewed sense of energy that is just as good, if not better, than mantras.